For two decades now GBA has been promoting the most complete portfolio of mooring equipment in the industry. Our involvement starts from project conception through design, specification, competitive tendering, supply, installation, after sales care to repair & refurbishment. No other company provides as extensive a range of products or integrates itself as deeply into the product life cycle as us. GBA has proudly partnered with Shibata in the region now for two decades. We have an excellent track record with some of the largest industrial projects in the GCC. With a resident Shibata design engineer based out of our Jebel Ali offices and our experienced sales team we offer our customers unrivalled support in the region. Visit the Shibata Fender Team website for more product & company details. Richards Marine has been an established name in the marine industry for over a century now. They have been industry leaders in terms of design an quality and have products installed in ports & harbours around the world. Global sales & support is provided by the Marine team at GBA Products. Both standard and customised Bollard types are available for all applications. For generations the Mampaey name has been associated with mooring hooks and high quality engineered products. For safety critical applications on hazardous jetties look no further for a fully integrated system that includes, load monitoring, berthing approach systems, ship to show link, environmental monitoring, remote control, LED display board and many other options. Mampaey also provide onboard towing solutions for tug boats and innovative new system such as the DOT (dynamic oval towing) and Dock Lock systems. Visit the Mampaey Offshore Industries website for product & company details. Since the 1960's Resinex has been serving the offshore industry with products that float. This includes, marker buoys, dredging floats, mooring buoys, ultra deep water floats, elastic & land beacons, barriers and a host of other specialised products. Resinex has international experience for both industrial, commercial and scientific applications. Whatever your requirement their expert engineering team can provide a well designed and economical option. Visit the Resinex website for more product & company details. 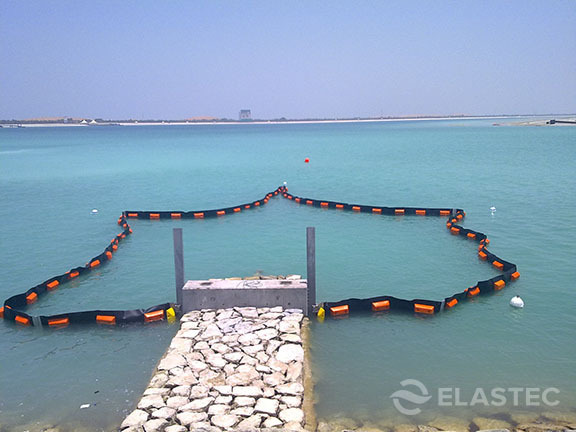 Elastec is a manufacturer of pollution control systems to and is dedicated to "Keeping Our World Clean". With experience working in some of the worst spill disasters and a host of awards for innovative products Elastec is the correct company to speak to when considering the value of your environment. For those who do not want to compromise there disaster response options Elastic offers a large range of products that have been proven in field to yield the best possible results. We can serve all sizes of requirements and provide appropriate equipment to meet our customers deployment strategy. For more information, please visit the Elastec website.